I have an unusual relationship with eating disorders. I never had one, but people often thought I did. I was the girl who was always just too thin, the one who couldn't beef up. The doctors thought I was diabetic, or maybe my thyroid wasn't working, something had to be wrong. My parents bought cans of protein shakes - I didn't want to drink it. We Are the World pulsed through boomboxes, my classmates and I sang along, knowing there was a problem somewhere, but too young to grasp it. It scared us sometimes, so we joked. The boys would turn a comb upside down and laugh about the Ethiopians holding the canoe and I would look away and blush. I was sure they were also making fun of me. Time passed, I was fourteen. Older girls, girls who didn't even know me, whispered that I was anorexic. I made sure to never let them see me sweat it, but their words singed. Sometimes, they burned. I carried the belief that there was something wrong with me, and everyone knew it. On my own, I'd often forget. The problem was, I was never alone for long. And I just didn't blend in a crowd. So, I learned to fill my plate in public even if I wasn't hungry (I usually was). I felt eyes on me if I walked to the restroom after finishing a meal. The fashion magazines that made most girls feel not small enough made me feel normal. I scanned the pages, eyes locking on models with knees that didn't touch and I felt a kinship, a sense of solidarity, like maybe I wasn't all by myself. At 16 I wasn't picked on much- not to my face. It was a whisper in the room, but I was confident in plenty of other areas, so I let this one thing gloss right over my knobby shoulders and down my bony spine. I'd be fine. It followed me to college, where the psychologist called me on the phone and point blank asked me if I was anorexic. I laughed and then I fumed. I was sick to death of explaining myself, so tired of being reminded that a girl who felt so typical and boring was seen as everything but. The 21st Century swept in and I was grown, I had a man who loved me. I was more comfortable in my skinny than I had ever been. But how could I not take it personally when the magazines that had once loved me so well now ran headlines in a 20 point font - "Men Aren't Attracted to Skinny Chicks!"? I didn't want to be someone else's self-esteem boost. Couldn't we all just stop talking about what was hot and what wasn't? Enough with the categorizing. The comparing. Wasn't there room for all of us? See, this is what women do, women who aren't careful, women who miss the point. We stack the scales in our favor. We make someone else be the sufferer. My friend Emily Wierenga wrote a moving, wrenching account of her struggle with anorexia. The wisdom in her words reaches beyond the confines of a particular disorder. It grabs at the core of who we are and wish to be, lassoing all the fall-out of our wanting. I read Chasing Silhouettes through the lens of who I am, all of my experiences, all of my scars. I was surprised by the ways I identified with her words. I think we all have our wounds. We've all felt the sting of hurtful words. We've all wished this or that away, we've wished that we could change something, switch it out with hers or hers. We're moms now. We look at our babies and things make so much more sense, but the world is even meaner, so we worry. Having spent years processing body image, I feel safe in saying that it's a struggle for almost every girl. The reality is, around 8 million Americans have an eating disorder – seven million women and one million men. Millions more struggle to fit, to blend, for one reason or another. If you know a young girl, you need to read this book. If your a mom, please read it. A youth worker? It's important to know the reality. Because maybe you don't know someone suffering with an eating disorder, but odds are you know someone suffering with a roughed up body image. And let's come together and promise to celebrate health, regardless of waist size. Let's celebrate heart, character, a laugh that shakes the rafters. There's so much to love about being a woman, let's champion every size and shape. We don't need a sufferer. Emily is giving a copy of Chasing Silhouettes to one FPFG reader. Leave a comment to enter! Tell us anything on your mind. *Purchase Emily Wierenga's new book Chasing Silhouettes: How to help a loved one battling an eating disorder within the first four weeks after its September 25, 2012 release date and receive a special invitation to watch an online forum on eating disorders with bestselling author Dr. Gregory L. Jantz, FindingBalance CEO Constance Rhodes and author Emily Wierenga. Readers must email a scanned receipt, a picture of them with the book or tell us when and where they purchased the book to events@ampelonpublishing.com, and they will be logged in to receive a special invitation to watch the event. They may also submit questions for the panel to answer, some of which will be selected and answered during the forum. "See, this is what women do, women who aren't careful, women who miss the point. We stack the scales in our favor. We make someone else be the sufferer." I HATE when this Mindi rears her ugly head. I hate comparing. Just told my small group of high school girls tonight that this comparing to make me feel better (in all areas of life-appearance, family, job, spiritually) so others look worse is definitely an area to be held accountable. Such a weakness when I begin to believe the lies of satan. And it's so ugly, too. Definitely need this book for many reasons. hey mindi--this is emily, the girl who wrote the book. i get it. i do. i love that you work with high-school girls. we need more people like you. hi ashley, this is emily, the girl who wrote the book. i agree. as women, it's second-nature to compare. sad, isn't it? bless you. e.
katrina, this is emily, the girl who wrote the book, and i LOVE what you tell your students, and how you listen, and point them to artists and writers who can inspire them... brilliant. bless you. e.
I love that God made all of us different. And unique. I just wish he would have made me YOU because gosh darn it...I hate being a fatty. hi friend, this is emily, and you are most definitely not a fatty. you are so beautiful. and i agree, i LOVE that you and shannan don't post pics of yourselves all of the time. bless you both. I was the same as you. Always skinny. Always eating. I was/am so hungry! One of my coworkers at my first real job out of high school called me bones all the time. I hated it and it still makes me upset when I think about it! Now that I've had kids my body has been able to gain weight but my BMI still says I'm underweight. Whatevs! hey staci, this is emily, the girl who wrote the book. i think you have the right attitude. if your body was able to have kids, it's healthy and well-adjusted. it doesn't matter what other people think. bless you girl. e.
i was the opposite of you. always hefty. and then in high school i alotted myself 600 calories/day and was ridiculously thin. thankful that God works in mighty ways and can heal us from these things. hi carissa, this is emily, the girl who wrote the book, and i am so glad God has brought you through this journey, and given you healing. bless you for sharing. e.
hi friend, this is emily, the girl who wrote the book, and i understand completely the whole body image thing in general, and wanting to be a light for your daughters. i think that desire in itself is often enough. i have written another book called Mom in the Mirror: Body Image, Beauty and Life After Pregnancy, with Dr. Dena Cabrera, which is coming out next May... i think it would address many of your concerns. bless you. e.
So, so true. My mother is naturally very thin. I am on the average side, and growing up she always complimented my cute rounder legs saying she'd always felt too thin, and as an adult she complimented my curves. My 10-year old daughter is her body twin, and I make sure to tell her she is so pretty. She hates being so small; people think she is 7 or 8. Our pediatrician wanted her and her older brother (also small for his age) to come in for regular weight checks, but I know they are strong, energetic and healthy and I'm not going to give them a complex about being small by taking them to the doctor to be weighed. Ugh. hi christie, it's emily here, the girl who wrote the book, and i LOVE how you and your mother handle body image/weight... it's so refreshing. you find beauty, and you compliment it, and you refuse to give complexes. this is wisdom. bless you. e.
Good word friend. I was the skinny girl (and I don't have a chest to speak of, which didn't help) Once a boy broke up with me and broke my heart... I was SO anxious about everything during that time that I lost some weight (which I didn't have a whole lot of to lose in the first place) and everyone questioned me...even our youth pastor's wife made me eat next to her every meal at youth camp- and I was a counselor! I look back and know I was probably just depressed. The Lord was working his miracles in my heart but I hated the whole "whispers" and "watching" thing as a side effect...throwing down a whole sleeve of Oreos convinced no one. :( I'd love to read the book! hi friend, this is emily, the girl who wrote the book, and how i ache for you, for that time in your life! if it helps i still have no chest to speak of, especially after having two little boys :) bless you. e.
women are the harshest and quickest to judge. see through to the heart....cliche but a simple truth. For me the turning point of having a healthy relationship with food began when I started to run and I ate to fuel my body. I ate to love myself, not hate myself. hi there, this is emily, the girl who wrote the book, and i agree. running has helped me too... but so has having two little boys. i think it came down to realizing my body was a vessel, not an ornament. love your insights here, friend. e.
I need this book. Probably for myself and for my daughter who at a young age already has issues with food. Thanks for this review, Shannon. I have no doubtan amazing book. oh kris, my heart goes out to you and your daughter (this is emily, the woman who wrote the book). let me know if you ever need to talk. my email is wierenga.emily@gmail.com. bless you both. e.
Yes, eating disorders. Sadly, it is part of my history too. But that's the thing. We all have struggled with body images at one time or another. I pray over my 9 year old daughter at night. She is so beautiful and perfect in every way. I want her to always see herself in that light. Pray, pray, pray! Sounds like a wonderful book. i agree jodi. prayer is really what matters, in the end. that's why i included suggested prayers in Chasing Silhouettes... because sometimes, when your child is dying (as i was, when my parents were trying to pray over me) your words run out... so i wanted to provide some words, should parents/spouses need them. bless you. thank you so much for sharing here. emily. As a past and current ED-struggling person, on my must read list. Thank you for sharing. hi there, this is emily, the author of the book, and my heart goes out to you friend. i know, having relapsed as an adult, that eating disorders never really leave a person's thoughts, even though we can find healing overall... may you know strength and courage and love each day, and how beautiful you are, friend. please let me know if you ever want to talk. my email is wierenga.emily@gmail.com. e.
Only satan could take something we need to survive...food and twist it in our minds. :( He is a rouring lion. Love what you wrote. yes gina. this is exactly it. only satan could take something we need to survive and twist it. i couldn't have said it better. e.
I'm a fat girl. I remember the comments from peers and sometimes teachers! I am an emotional eater (not one of the "popular" eating disorders) and those thoughtless words didn't help one bit. We have the body type we have because God chose that for us. One of the curvy (she is NOT fat!) girls from our church youth group called me not too long ago. She was crying. "What's wrong with me?" she kept wailing. Well, nothing is wrong with her. She's the way she is because God has a plan for her life that includes her body type. What I wonder is what is wrong with our society that we harp on outward appearance so much that our young girls are willing to literally starve themseleves to death? I have lost weight in the past. I, too, am always hungry! I don't think there is anything wrong with me anymore...but, believe me, I used to! God will hold us accountable for those thoughtless words that wound our precious young ladies. I can't even think about the people in our world that we judge and dismiss because of their physical appearance because it brings me to tears. Everyone deserves to be treated with kindness and dignity because we are created in the image of God. I weep for our world because we have been so blinded. oh friend. this is emily, the girl who wrote the book, and i weep with you. i love your heart. God is going to use you in a mighty way to bring freedom to a generation of hurting young people. thank you, for speaking up so boldly. bless you. e.
This sounds like such a great book. Her art is wonderful, too. Thanks for the recommendation! hi abby, this is emily--the girl who wrote the book and painted the painting. thank you, from the bottom of my heart. for your candor and encouragement. may you be blessed. e.
It's so true--just about every single one of us women has some sort of body image questioning and wrestling. Emily's book will change lives. Truly. amy, you are such an encouragement to me. thank you friend. Would you believe that as a young girl who struggled with weight, I can remember wishing that I could develop an eating disorder, rather than feel like people were watching every bite of food I ate as if it would instantly appear on my hips. I was so self-involved, and still am sometimes, not thinking about the way that people actually are affected by those things. Amen, FPFG. Why does we care so much what's hot and what's not!? hi sarah, this is emily, the girl who wrote the book, and friend, that's exactly why i wrote the book. i woke up one day and realized i'd put my family through hell. and that maybe by writing this book, i could help other families, make it a bit easier for them... bless you. e.
Low self esteem is hard to overcome. And for some it can take a lifetime. I was so insecure about making the wrong decisions and felt like everyone else could do a better job. But one day, a few years ago, I read someone write," I was so afraid of being wrong, I allowed others to be wrong for me." Something clicked, and I gave all my doubt to God. It seems like we are all plagued with twisted thoughts that the enemy uses to hinder us in being who and what God created us to be. This book looks amazing, I work with teenage girls every day, I am actually commenting though because I want you to check out something. I remember last year when you earned all the money for the water well and I am wondering if you would check out this website/blog and see if you would like to post on your blog about this family and see if you could get all your readers to help out. This family reminds me of you (I stalk your blog every day!) Go to www.puzzlethemhome.org This family has adopted 6 children with special needs and this site is trying to help them build a more suitable home for these children. You can also check out their personal blog at www.abeautifulroad.com Their daughter Graci comes to my dance studio and they are truly an amazing family!! Make sure you watch their announcement video it will make you both laugh and cry! hi there, i'm emily--the girl who wrote the book--and i just wanted to thank you for working with teenage girls. i used to, as well, and now i am fostering a couple babies that they birthed, and i wish more women would take young girls under their wings. so thank you. Hi there - thanks for describing how difficult it was for you being skinny! My son (9yrs old) isn't even on the growth curve for weight - never has been above the 10%tile. We did so many metabolic tests, made him drink all those high calorie protein shakes, and about 2yrs ago I just said, "Enough". He's healthy, growing and even though he has to cinch up his pants, and will never fit the waist of his age clothing, I decided it isn't worth trying to bulk him up - for what? I am so glad we stopped thinking about it, letting it control our days, b/c the truth is, he's an amazing kid and I don't want him to ever miss out on all the great things God has made in who my son is! I would hate for food and body image to be his focus for life. He now eats a ton, and maybe will fill out one day, but if he never does, he's a wonderful person and gift to us. I hope other skinny people and moms of skinny kids find encouragement in your words, as I did. juliann, this is emily, the girl who wrote the book, and i have a sister in law who's going through the same thing with her boy. he's strong and fit and just very small. but she too is learning to embrace it because we're all perfect in our own unique way. bless you. e.
hpatterson, this is emily who wrote the book, and i completely agree with you. we all struggle with self-image and esteem. they say 75% of women have disordered eating. i LOVE what you decided 13 years ago. absolutely beautiful. bless you. e.
Thank you so much for sharing about this book, I had never heard of it. I suffer from the "always thinking I'm too big" thoughts and my husband has to drag me back to reality. I did have a sweet roommate in college who was a "skinny girl" just like you. I always thought it would be so great, because I saw her eat whatever she wanted, and then, she would share with me the mean things that people would say and how hard and hurtful it was for her. I never, ever forgot that, and was so grateful that she shared her heart with me. Thank you for sharing yours. It really gives new perspective and helps us all to get over the whole grass is greener on the other side thing. dear leslie, this is emily (who wrote the book)... i can totally relate. my husband often drags me back to reality too. may you know how beautiful you are, friend. bless you, e.
I have six granddaughters. It sounds like this would be a valuable book for Grandma to read. Please enter me in your give away. mitzi, i wrote the book, and i love your heart for your granddaughters. bless you. e.
Thanks so much for the book recommendation. A few years ago I had to confront one of my best friends about being anorexic. After years of coming down hard on her for not eating and exercising too much, she mentioned to me that she was going to the dr b/c she stopped having periods. I knew that was a symptom of anorexia, so I did some research about the condition (her dr didn't catch it b/c my friend was particularly underweight) and I finally confronted her with a loving spirit, rather than angry as I had always been before. She admitted everything to me (man, the details get scary) and she got counseling. She says she's better but she looks thinner and eats less than ever. Every time I ask her about it, she assures me she's fine. I don't know whether to believe her or not. I will definitely be looking into this book. Hopefully it can help me understand my friend better. hi christy, this is emily, who wrote the book. 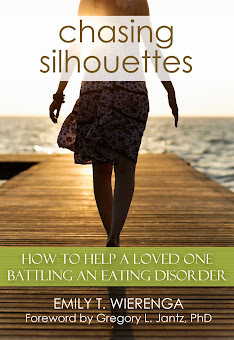 i love how you handled the situation... i do offer advice for friends with eating-disorder loved ones in the book. let me know if you ever need to talk. my email is wierenga.emily@gmail.com. bless you. My daughter had an eating disorder and I honestly had no idea until she old me. Thank you for addressing this issue. And you are so right, why must we knock each other down just to make ourselves feel better. Love your blog! sandy, this is emily (who wrote the book)... if you ever need to chat, i would be very open (i went through anorexia as a child and as an adult)... my email is wierenga.emily@gmail.com. bless you. your words amaze me... once again! :) oh, how I have struggled with my body image...and even though I grew up in an amazing home with affirming parents, I have a hard time believing that I am beautiful. ..still struggle with it. Anyway, I work with teen girls in Elkhart and would love to see what this book is all about! Thanks! my 10 year old daughter is super skinny and can't gain weight no matter how much or how badly she eats...yet, i hear her talk about dieting?!!?! i on the other hand - have always been an average size desperate to be skinny....it stinks to have the world tell us what to look like and what to weigh! hi friend, this is emily... i wrote the book, and would be happy to chat with you if you ever need to. i struggled with an eating disorder as a child and as an adult. my email is wierenga.emily@gmail.com. I know women who struggle or have struggled with eating disorders. Emily's book sounds like it would give some insights into their inner turmoil and help me understand more about this huge issue for women in our culture. hi laurie, this is emily, the girl who wrote the book, and i ache for those women. i ache for their families. it's so hard to understand the inner turmoil unless you've been there, and even then, it's hard. i try my best within the pages of this book to convey the thoughts of a disordered eater, as well as advice from those on the outside. bless you for your compassion and concern. e.
This is powerful truth. Thanks to you and to Emily for being so transparent and brave. Will definitely read this book and pass it on. Thank you Rach. I long for it to get into the hands of the church and high-schools... thank you for helping pass the word along. Bless you, e.
Ive alwasy been intrigued (maybe thats the wrong word?) by eating disorders of all types. There was a time in my life where I could relate on a small scale to what it is like to have such an obsession with food or lack thereof. I would love to read this book. shannon you are the bomb diggety! i silently read emily's blog, amazed by her courage and candor....i am looking forward to reading her book. as a mom of a young athletic daughter, who happens to be on the smaller end of the growth chart, i often worry about her perception of herself. as a woman (me), who recently lost 30lbs, i am aware of the positive feedback when too many people notice the change...the balance is off in our world about the way we look, the size we are and how we compliment one another. I fight this battle, too. The comments of "how do you stay so little" and "don't you ever eat?" Back-handed compliments can sting, too. I would love to be prepared for what may face me down the road as the mother of two girls. Self-image is a struggle for women always, I'm not sure it ever goes away. Hey twin. ;) I like your style. Nobody accused me of having an eating disorder. Three older brothers and a knack for sports gave me the reputation of lesbian. Never mind I I had boyfriends. Never mind my answer of "no" when girls asked. Clearly the only reason I was good at sports and the boys in middle and high school let me hang out with them MUST be because I have similar taste in women. I let it roll like water to the duck, but sometimes I couldn't quite hold my chin high enough. The devil got to those girls without them having a clue. He's a professional loser. This book looks great. I am glad you love your skin. We sure do. oh man, this is so tough... and yes, we all have our battles. the devil is a professional loser, indeed. bless you. e.
The boys in Junior High used to sing "Ain't Got Nobody (no body)" when I would walk down the hall. They nicknamed me "The Great Plains" and my rival "The Rocky Mountains". In High School I became a nervous, invisible wreck. Now advance the calendar to my 42nd birthday. I'm still thin, but have discovered that a few pans of brownies and whatever I wanted to spray whipped cream onto whilst staying thin is a pretty cool thing. My Great Plains gained a bit of weight and became the Smoky Mountains ~ not quite the Rockies, but that's okay because I married a ButtMan. My ButtMan told me that God Himself let me be unimpressive during my school years because He was preserving me for him. LOL. Gotta love him. He says I'm "impressive" now. I ran into The Rocky Mountains a few years back and she is now Mount Everest. LOL! And I'm still nice and thin. I tell my young daughter not to stress about body image because it all shakes out in the end. Health is our goal ~ both physical and mental. health is our goal--both physical and mental. LOVE this kate. thank you for sharing. bless you, e.
what a great commentary from a different point of view. truth is, you've covered every 'thing' , anything that makes us different than another group of people. we just need to love each other & value the things that make us different. that was my life as a teenager. I grew up feeling wrong, broken, inadequate. I got diagnosed with an illness in 1997 and realized that people had been calling me "sick" for years even when I wasn't. It was a big wound and I spent years in counseling and years with God speaking his truths to me before I realized I am healthy and whole both inside and out!